When I was in college, my mother gave me two pieces of advice. One I followed right away while the other one it took a few years for me to follow. Both were the best pieces of advice because they have shaped me into the person I am today. The year was 1995. I was in my second year at the local community college. During the fall quarter, I had worked in the cooperative education office but had been let go because of something the other student worker had done. (I don’t remember what the reason was for the dismissal.) Even though I let go, I still was part of the office. Anyway one of the administrators who worked in the office had gone or went to my grandparents’ church. He told my mom that he could help her with a job or something. While she was in his office talking to him, she noticed a sign. The sign was for the Disney College Program and when the interviews were going to be held. I knew about the Disney College Program but had really thought about interviewing for a position. Mr. M. was the professor in charge of our community college’s Disney College Program. He coordinated with the Disney Company so that local students could interview for the program. Then he made sure we did all prerequisites before heading down to Lake Buena Vista. He was also the person we turned all of our assignments into while we were down there. Mr. M. even came down to visit while we were in Lake Buena Vista. As I said, Mom noticed the sign for the Disney College Program. When she came home that evening, she suggested I interview for a position. 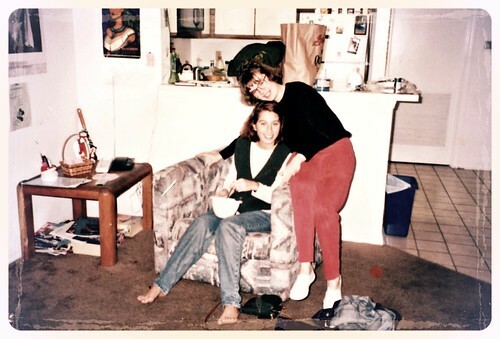 On March 15, 1995, I followed her advice and interviewed with the Disney Company. A month and a half later, I was accepted into the program. Four months after that, I was on a plane down to Orlando for an experience that would change my life forever. The other piece of advice was given to me by her a few years later. She told me that I should not major in elementary education. Instead I should major in special education. She saw that I had more qualities that would fit a special educator than a general education teacher. I did not heed her advice. Instead I majored in elementary education. A few years after she gave me the advice, I was hired not to be an elementary teacher but to be a special educator. So I had to go back to school for more classes. I was meant to be a special educator. She was right when she initially gave me the advice. 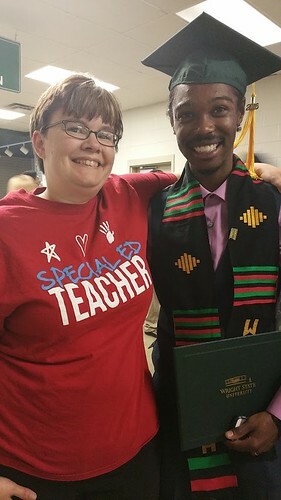 Last spring I had the opportunity to watch one of my students graduate from college with his bachelor’s degree. I had taught him my first year of teaching. T. and I went out to lunch the day after his college graduation. I confessed to him that when I taught him, it was my first year of teaching. He told me that he thought I had been teaching for years. It was so natural for me. What is some advice that you had been given? Did you follow the advice or did you ignore it? You received some great advice that helped you. It usually takes me a while to take the advice that I am given. I am taking some advice and starting another path with an activity that I do. LOVE IT! As a gen. ed. elementary teacher, I love working with our sped. students. I take every chance I can to collaborate with special educators. That was some great advice! Visiting from Mama Kat’s! I think that program at Disney is great. What a great moment to see a student graduate college!